THE Mattie Kenny era for Dublin hurling began in Carlow tonight with a Walsh Cup victory over the home side. The former Cuala boss witnessed his new team beating Colm Bonnar’s Carlow by 2-21 to 1-16 in Netwatch Cullen Park on a night when the rain pelted every corner of the ground and roughly 100 spectators looked on. Whatever the reason behind bringing the start of the Walsh Cup back into December, promotional value wasn’t it. Beforehand, as the Dublin bus pulled up to Netwatch Cullen Park, the photographers were there already and waiting for the first shot of Kenny in official Dublin issue on official Dublin business. Dublin played against the howling wind and driving rain in the first half but the early signs of Kenny’s work were apparent. John Hetherton, named at corner-forward, moved out in search of high ball and in order to leave room for the returning Donal Burke and Eamonn Dillon although the most striking feature of Dublin’s play in the half was Fintan McGibb’s pace. 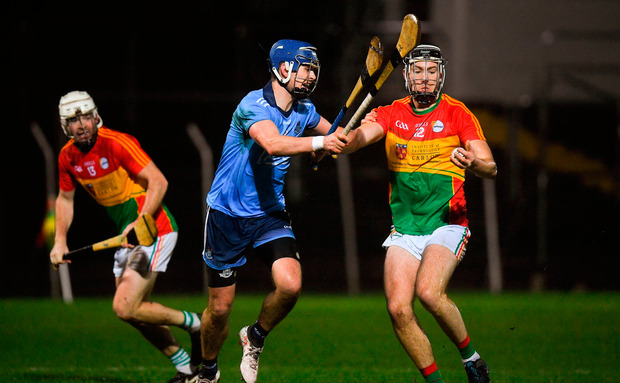 Mostly Carlow relied on Martin Kavanagh’s frees to keep them going in the first half and they hit six points without reply after Dillon’s goal and before he missed an even better chance for a second. That Dublin went in two points ahead at the break was due mostly to their extra gear in attack and Hetherton’s sweet striking from frees after he assumed duties from Burke. In the second, after Carlow briefly went ahead when Ted Joyce scored a goal in the 37th minute, Dublin took over completely. McGibb was even more influential in the second half than he had been in the first. He broke the cover to send Dillon in for what looked like a certain goal but after he was hooked, the Setanta man managed to poke the ball past Brian Treacy in the Carlow goal. That ended the game as a contest. Burke added a trio of stylish points from his new spot at centre-forward while McGibb – easily the game’s outstanding player, finished with 1-2. SCORERS – Dublin: J Hetherton 0-10 (7f, 1 ’65), F McGibb 1-2, E Dillon 1-1, D Burke 0-4 (0-1f), C Conway 0-2, S Treacy, S Moran (f) 0-1 each. Carlow: M Kavanagh 0-12 (10f), T Joyce 1-0, R Coady, J Murphy, C Nolan, J Nolan 0-1 each.